42, Lorong Rahim Kajai 14, Taman Tun Dr. Ismail, 60000 Kuala Lumpur. 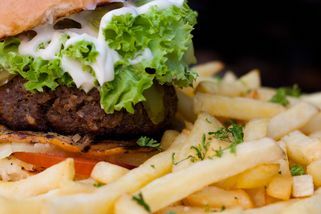 Sun-Thur: 4pm to 1am, kitchen open until 12 midnight. Fri,Sat & Eve of Public Holidays: 4pm - 2am, kitchen open until 1.00am. Same road as Maybank. Opposite condo. 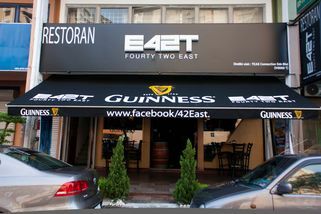 Situated in the ever popular area of TTDI along a street teeming with nightlife, 42EAST Restaurant & Bar offers a great atmosphere for families, sports lovers, and working young adults alike. 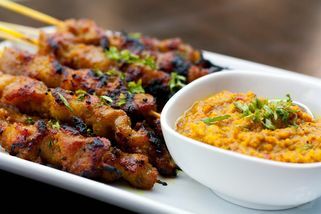 Famed for their pork ribs with Guiness glaze, this restaurant specializes in pork dishes such as pork burgers and Pork satay. Not a fan of pork? 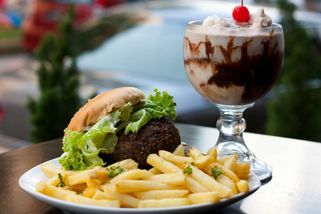 Not to worry, they also serve many other dishes such as salads for veggie lovers and pasta. 42EAST is also a Tiger FC venue for all EPL football games—there are voucher giveaways for lucky draw winners (and people who guess football final scores correctly) worth RM300 and RM200. If you are a fan of live music, visit 42EAST as they feature performances by unplugged bands. On the other hand, if you’re a fan of comedy, they also have stand-up comedy acts once a week (Coming soon) Wednesdays are ladies night, during which ladies get their 1st two cocktails absolutely free; and subsequent drinks at only RM4 (excluding service tax). 42EAST serves Guinness, Tiger, Kilkenny drafts, a range of bottled liquors, cocktails and mocktails. 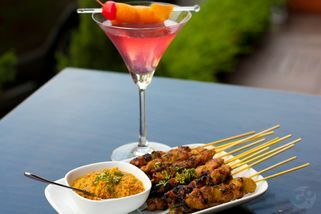 42EAST also caters for anyone interested in holding their functions such as birthday celebrations and company and club events at 42EAST. National day.... I decided go to celebration early with my friends at 42 east that I checked on web that introduce that the Ribs are not bad. I know their famous is pork, I though there also serving beef rib but actually is not.. (too bad). I have no idea what should I order, so I request their waitress to recommend some special food for us. 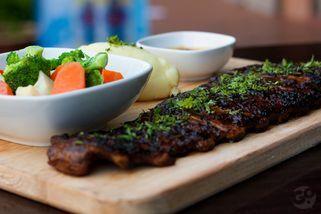 Finally we order Caesar salad, 3 sauteed mushroom, half slab BBQ Pork Ribs, Sausage Platters ( Premium). The Sausage Platter are showing on the menu, you may need ask the waitress what kind recommend food on that day. The portion is big (for ladies, yes it is). There got 2 kind sauce for the Pork BBQ ribs, sweet or spicy, I take the sweet one. When I eat the Pork Ribs, I bit regret to take sweet sauce because the ribs taste sweet. No doubt the Pork Ribs cook very soft and nice without any sauce dipping. The sausage platter are too much after we eat the pork ribs, I think guys will love it so much!! . The waitress told us on every Wednesday is Lady night, Cocktail is RM4.00 per glass. Very valuable, may go there to try the lady night next time. Wanted to recommend this to my sister for her bday party, but how come the site has no menu? This place is famous for its ribs, so if you're gonna visit, don't order anything else! 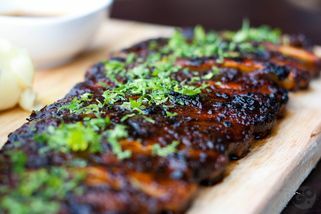 They have their own special secret glaze, which is what makes the ribs so good, I think. It's a huge serving too, so you can share with friends.